Homemade cereal bars are easier to make than you think, and infinitely tastier than the store bought varieties! As an added bonus, these bars are nutrient dense, gluten free, AND vegan!! My kids have always loved cereal bars. I never got it…they were too sweet for me. When we had to go gluten free, the options out there for this breakfast staple were pretty dismal. Not only were they atrociously expensive, they left more than a little to be desired nutrition AND taste wise. My kids couldn’t even go through one box. First, I couldn’t blame them! Secondly….they were not nutrient (or healthy) dense at all! Can Cereal Bars Be Made Healthier? loaded with sugar! A high sugar breakfast is not in the best interest of anyone, including our kids! Sugar is a short lived energy burst followed by an inevitable sugar crash. A balanced meal of slow burn high fiber carbs with some protein and healthy fats is a much better way to go. problematic ingredients: when conventional corn and wheat products are used, there is a high likelihood of their being GMO’s inside. For us, this a is a big problem as glyphosate residue in GMO crops in the US are often bed mates. I don’t think anyone could argue the damage that Roundup, in any amount ,can cause our guts!! My son is super sensitive to it. But now I have something better to give them, and YOU do too! Meet the quintessential cereal bars with no weird ingredients. Wholesome nutrients and allergen free goodness are first and foremost here! Healthy fats, fiber, and some protein!! 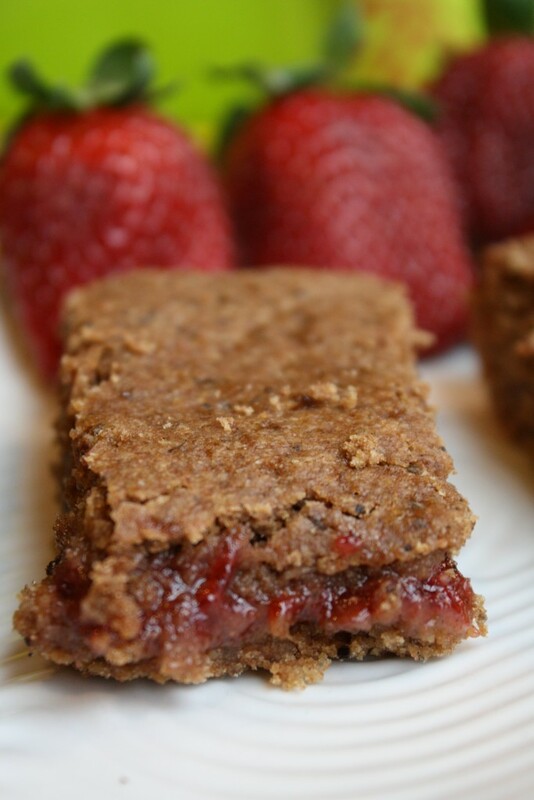 Think Nutrigrain Bars…but healthier and tastier! Seems to me, that is a mom win! These cereal bars took a lot tries to get right, therefore, I hope you think they’re worth it! Woot woot!! Make your oat flour by whirring rolled oats in a coffee grinder or blender, it’s easy and works great! Trader Joe’s make some great lower sugar jams. St Dalfours brand has no added sugars and is sweetened with fruit juice only. I use this same dough to make my gluten free and vegan emapañadas!! Want some more kid-friendly breakfast ideas with wholesome ingredients? In a liquid measuring cup, whisk the wet ingredients. Pour into the dry mix and blend until a soft dough is formed. You may add a couple tablespoons milk if it is necessary. Divide the dough in half. Grease an 8 x 8 pan or line with parchment paper. Invert the rolled dough into the pan, pressing and smooshing until the bottom crust is dispersed. Gently remove the parchment. Spread your filling evenly over the bottom crust. Roll out the top crust in the same manner, and flip over onto the top of the filling. Press and smoosh with the parchment in place and then remove when you are happy! I have also just moved pieces of the dough and overlapped pieces as a top crust...works great too! Bake for 20-25 minutes until the center is set. Place all ingredients in a small sauce pan over medium low heat and simmer for multiple minutes. Once cooked through and thick, puree with an immersion blender for texture-averse kiddos! I just made these tonight and they’re super delicious! I used millet and buckwheat flour. It was a little gooey to spread, but not too bad. We’ll definitely be enjoying these often! Great Jamie!! We make them all the time to still…and yes, the dough IS sticky…but it keeps the end results very moist! These would make great snacks for the kids! I don’t use oat flour, but I think a mixture of sweet rice and either brown rice or corn flour would work well in it’s place. Thanks for sharing the recipe. I’m sure my kids will enjoy this. I was just curious if you know if these freeze well? And for a kiddo who can’t tolerate oats at all – including gluten free oats, would a different kind of gluten free flour work? I haven’t made that determination yet with my kiddo, but just in case thought I’d ask. Thanks! Oh yes Kristina…I freeze them all the time, it is how I store most of my baked goods for freshness. I would use brown rice and maybe a little tapioca for the oat flour! Found your site on Pinterest. Have made your cereal bars twice now with oat and brown rice flour. My daughter loves them. The recipe is quick and easy. Had wanted them for a quick breakfast idea for when we are running late but they don’t see to last long. Thank you. I can’t deal with oats (heart attack symptoms!) too scary to try them. So just wondering what to replace it with and how much. Would like for like with a gluten free flour be fine. If I went a coconut flour route I guess I would need less? Need to wait now to get home to test it! I would do half tapioca half brown rice Elinor. Oat flour lend elasticity, so that is the reason I suggest part tapioca. Do those subs work for you? Tried these today with sugarless jam from our local Amish store…need to add more next time. Very yummy, thanks for the recipe. Do you have your honey sweetened jam recipe? I can’t remember which jam recipe I used Michaela, maybe one from Whole Life Nutrition blog. I sometimes add more jelly too..it totally depends on which jelly (and how sweet it is) that I am using. Thanks for letting me know! Darn it! I am using a brand new computer and printer, cannot get this to print!!! darn technology Barb! Cut and paste always works for me too! These look GREAT! Pinning for later! I think I’ll try apple butter in place of either/both apple sauce and jelly. It’s what I have on hand. Hi Anjanette…apple butter should work great, however I would reduce the palm sugar in the crust as apple butter almost always has sugar… Do it to taste! I am loving all the gluten free recipes you share. We’ve gone 100% wheat/gluten free and so I appreciate gluten free recipes that are this yummy sounding! 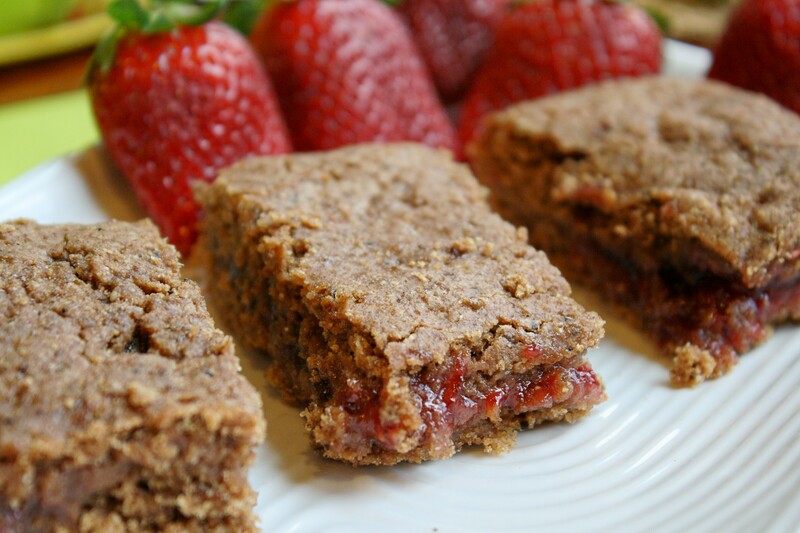 I just love homemade cereal bars and this recipe looks wonderful. Hope you have a fabulous week and thank you so much for sharing with Full Plate Thursday. I agree, commercial cereal bars are often far too sweet. I really like your homemade version. They sound really delicious and satisfying. Thank you for sharing this recipe with the Hearth and Soul hop. You always have such delicious-looking baked stuff. Thanks for sharing! Pinning this one. I prefer cereal bars to regular granola bars… this might be what I’ve been looking for! Very sweet Steph, thank you! I SO appreciate all your hard work. These look great! Amazing – thanks! Won’t show these to my boys—yet. :). You made them Adrienne? or just liking the look of them? These look scrumptious. Always looking for a new reasonable lunchbox treat and my little ones have gotten a little bored with mine. 🙂 These look like a nice alternative. Thanks! Hi I’m hoping to make these tomorrow, but I have two quick questions. 1) Can I maybe use another egg-replacer in this recipes besides the flax and chia seeds? I can’t have either, but I can have xanthan gum or I also have Ener-g egg replacer. I was thinking about just using the Ener-g egg replacer, but I’m not sure how much would be equivalent to 2 tablespoons of flax or chia seeds. Or even with the xanthan gum, I’m not sure what the appropriate equivalent amount would be. 2) I have a huge bag of Bob’s Red Mill gluten-free quick cooking oats. Can I grind these to make oat flour even though they aren’t rolled oats? Hopefully you can help me figure out these substitutions and what not. Thanks! Hi Dana! I would use couple teaspoons of egg replacer….or a 1/2 teaspoon of gum. The applesauce is a great binder…so those may not even be necessary! Quick oats are always a great option too….they grind down into the same thing! This recipe is AMAZING. It is a lot of work, but well worth it. 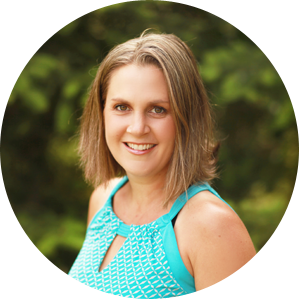 I was tired of buying gluten free fruit bars for my kids – they are expensive, aren’t organic (main ingredient probably being GMO corn), and quite frankly they don’t taste good at all. This recipe rocks my world. I changed it up a bit; I doubled the recipe, and used ground pumpkin seeds and a bit of coconut flour instead of the teff flour. Yum, yum, yum yum. Thank you! OO, I love your idea of adding pumpkin seeds Nicole! So glad you enjoy them as much as we do! I just came across this recipe and it looks fantastic. I would like to make them without the sugar tho. Is the sugar totally necessary or could i use something else like coconut?? Hey Aleisha! You could replace up to half with stevia…use some applesauce in place of some if the oil…it is up to you and your tastes! Adding coconut would be fine too. I think the recipe would work without the sugar, just never tested it that way! I’m thinking about using the dough for the base of pumpkin pie. Have you ever tried that? Just curious….Thanks. that would interesting..it is more cakey than shortbread/crust dense. You could also use the dough from the Amazing Allergen Free Choc. Chip Cookies…that is more of a shortbread texture. Let me know what you come up with! Since my daughter can’t have nuts, I subbed the almond meal for quinoa flour and added a couple of tablespoons of coconut milk. It didn’t roll out but I was able to press it into the pie dish well. I tasted it this morning and it was great. Happy Thanksgiving! Woohoo! So glad you had success! Thanks for letting us know! and thank YOU Christine for taking the time to let me know! it’s comments that keep us bloggers fueled and affirmed! we adore this recipe too…I have been experimenting with different filling lately for fun….most recently a pumpkin butter filling! If I wanted to omit oil do you have any recommendations for substitues?? sure, applesauce or prune puree Nichole! hi. i’m new to your site, but i’m loving it so far. these bars look awesome, and i really think my kids will love them. i am a homemade kind of girl. i love to try new things and make things myself. we just found out my daughter can’t have wehat and dairy, or peanut and tree nuts. i’ve always wanted to make cereal bars for them instead of buying them, and now i actually need to. we can’t use the coconut oil. i saw that you said applesauce, how much should i use instead of the oil? i’m very excited to make these. i’m gonna get all the ingredients tonight and start testing tomorrow! Hi kristin! The good news is that you were already homemade kind of girl…for people who have to transition from buying everything to making everything, it can be a tough transition! Why can’t you use coconut oil? It is not a tree nut…so just curious. You can also replace with any light-tasting oil you prefer (I like LIGHT olive oil), but any vegetable oil would work too. If you go the applesauce route, then use 1:1 ratio for the trade! I am here to help…it can be a bumpy road in the beginning as you get used to cooking with new ingredients that behave differently, but you can do it and the pay-offs are worth it! I have been looking for a recipe that was like some of the bars I had while in England. These sound really close. I am going to add diced dried bing cherries to the dough and leave out the jam. Another option that sounds good to me is to use fig jam. Thanks for the recipe. SOunds like a good idea Audrey! I also have a fig newton recipe, and have used fiig jam in this recipe too1 Lots of options, hope you get to try them! BTW, do you have any ideas for a yogurt based filling (egg free)? Looks great! How necessary is the flax/chia? Any recommended substitutions? My daughter is allergic to all seeds. Thanks! Hi Jennie! flax and chia are binders…..I bet in this recipe you would be OK…you could also sub gum, maybe a half teaspoon! I tried it and it turned out great! I used 1 1/2 cup of oat flour and 1/2 cup of quinoa flour. I used a mango butter filling I bought at Trader Joes and my kids gobbled them up. Thanks for the great recipe! Mmm..mango butter sounds fab Jennie! Glad you liked them!! I hadn’t thought of a yogurt filling before…buy now i am intrigued and will have to investigate! These look great!! I can’t wait to try these for school snacks! How long do they stay fresh in the fridge? i usually freeze individual portions for quick lunchbox stuffing Andrea…I haven’t tested the fridge yet! I have left them on the counter for a few days with no issues…. I get it Janel…the one drawback to making all these healthier goodies..having yummy snacks around to gobble up all the time! So glad you like them, I appreciate you commenting and letting me know! Wow those look wonderful. These would be great to travel with this summer. Love that you took this idea and made a healthy version. Bravo. Thank you for sharing it on Friday Foodie Fix. Thank YOU Diane, excited to be particpating! I just made these and they turned out great. Instead of brown rice flour I used King Arthur GF multipurpose flour mix. I was surprised and how good the batter tasted. I made the filling myself and even though it was a little runny it turned out fine once I baked it, I wish I had used more filling! Next time I will use some stuff to make jelly and put lots of it in there. really good recipe! *note, I sprayed my fingers with pam spray and i was able to mash out the dough fine with my fingers. getting it into the pan from the parchment paper didn’t work, it flopped over but it was easy to press it into the pan and for the top crust it looked better but I still had to do some fixing. next time I will cut the dough in squares and put it over the top. Thank you for taking the time to comment Aimee! I think I will be changing the recipe to include more filling…it kind of depends on the jelly….regular ole jelly is super sweet, so a little can work….but I love people’s idea of using a quick homemade jelly! So glad you like them…a favorite here too! Just made these today – I'm the only gluten-free one in my family, but everyone loves them! For the filling I just cooked down frozen strawberries and raspberries with some arrowroot powder. I'm trying not to eat the whole pan! I would use a mixture of oat flour and all-purpose, or all whole wheat pastry flour! Good luck! We're not a gluten-free house, but I'd love to try this recipe! Can I use regular whole wheat flour, or do I need to get special pastry flour or whatnot? Thanks you for telling me Marissa! What a fabulous idea to just cook down some whole fruit, I will try that next time! I like the new look of your blog! It's lovely – and so are these wonderful cereal bars. I agree, the store bought ones are way too sweet, and your homemade version sounds delicious! New to your page and this is the first thing I saw, yum! Looks amazing, can't wait to give them a try! Made these and they are delish!!! Even the hubs thought they tasted like the store bought version!!! I don't know what to look at first, these bars or the site upgrade. Oh my goodness. Just beautiful. Eye candy – all of it! Great job Tessa!! Tessa, You are such a genius in the kitchen. Now these are the kind of cereal bars that kids need to be eating and schools need to be serving! Your site's new look is fantastic!! Your cereal bars look great! I like the new look of your blog.